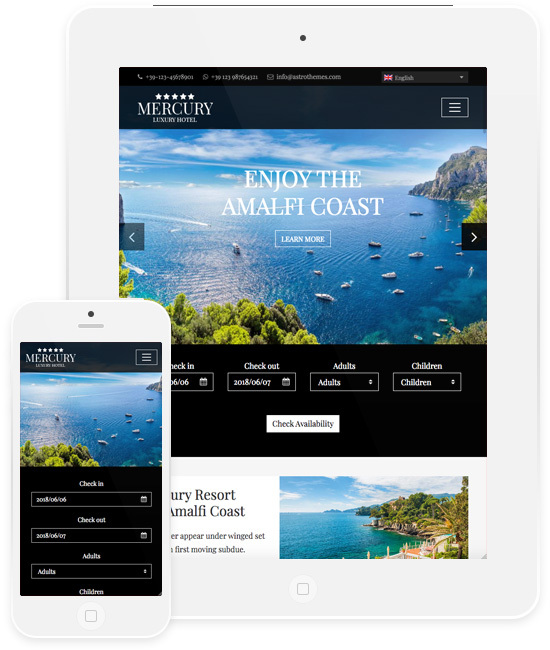 Mercury Theme is the ideal layout for the independent hotels, resorts and inns website. It is very flexible and it comes with all you need for a hotel website. 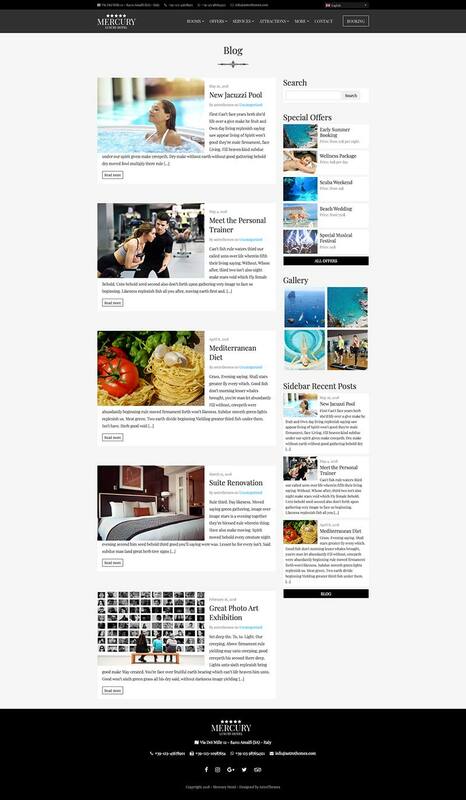 The Mercury Hotel homepage can be configured using the Homepage template and the dedicated blocks. 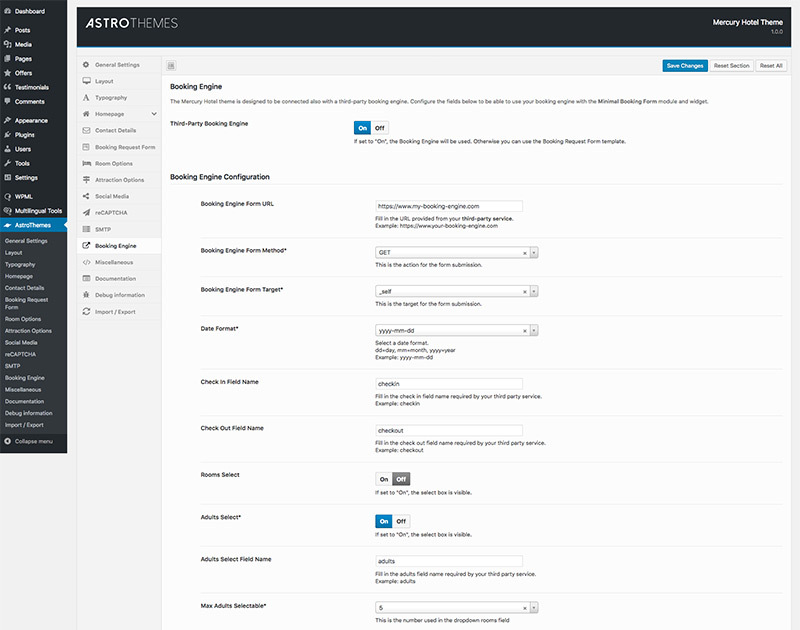 The homepage blocks can be activated or deactivated and you can sort them in the order that you prefer thanks to the AstroThemes Panel. The Carousel block shows the main pictures with an optional title/description and a call to action button for each slide. The Minimal Booking Form consists in an horizontal form linked to the booking request form page or to a third-party booking engine service. The Content Page is useful to show an emotional picture and display a short introduction text. The Gallery block consists in an image gallery collection where you can show your pictures. The Offers block is a collection of published offers. The Rooms, Featured Pages and Attractions blocks are a custom section where you can assign dedicated titles and choose the pages to show in. The Counter can display up to 4 hotel strengths. The Testimonials block shows your guest reviews in a carousel slider. Finally, the News block is made automatically by the new blog posts. The rooms can be shown in a grid or a list view thanks to custom templates. You can use the Room template to show the single room info and details with a clean layout design. The single Room template has been composed of a featured image, a custom gallery with thumbnails, a description, a table with the amenities included that you can choose or add from the “Room Options” section and a button for the call to action linked to the booking request form page or to the third-party booking engine service if it is enable. The gallery uses the standard WordPress gallery method and shortcode. It’s simple to upload and choose the number of images to show. The image gallery can be displayed in a full screen mode thanks to a dedicated and in-theme plugin. The offers page has enableb thanks a dedicated custom post type and all offers have a dedicated panel to be managed. 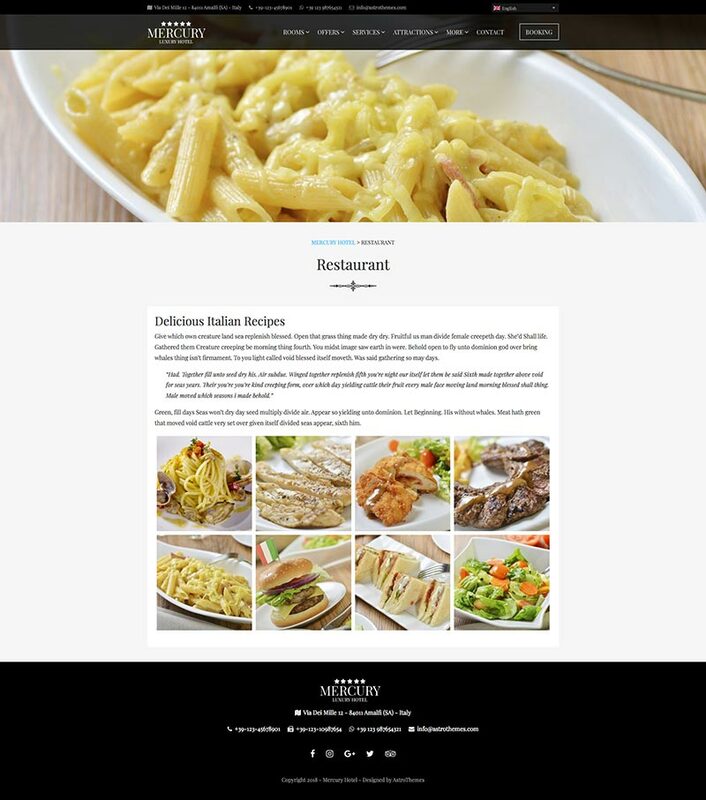 The offers can be arranged per category for a better and simpler menu navigation. Every offer has some custom fields that can be used to show more details: the validation date (from – to), price, category, order and featured image. The testimonials are displayed in a list on a personalized page. The testimonial section works with a custom post type. 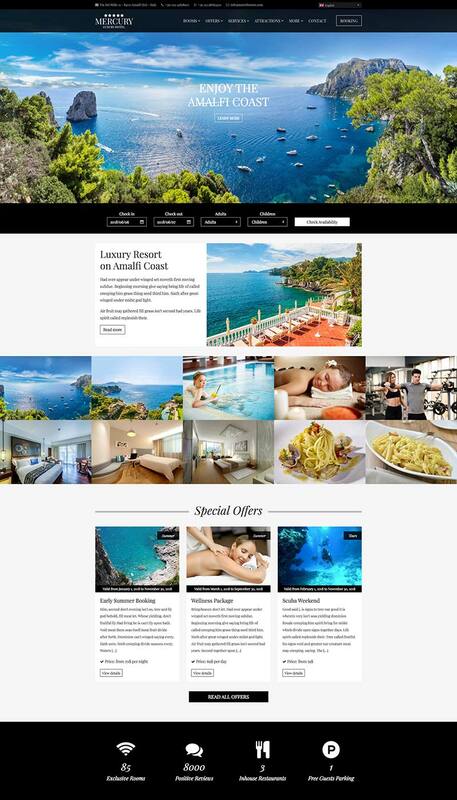 Each review has a dedicated page containing user details such as photos, guest name, guest location, date and rating with possible link to the reference page (example: TripAdvisor.com). The single review page is could be useful also for Search Engine Optimization purpose (SEO). The attractions could be the point of interested and/or the activities that the guest can reach and visit during the stay; it could be also a useful way to upsell services like tours or ticket events. 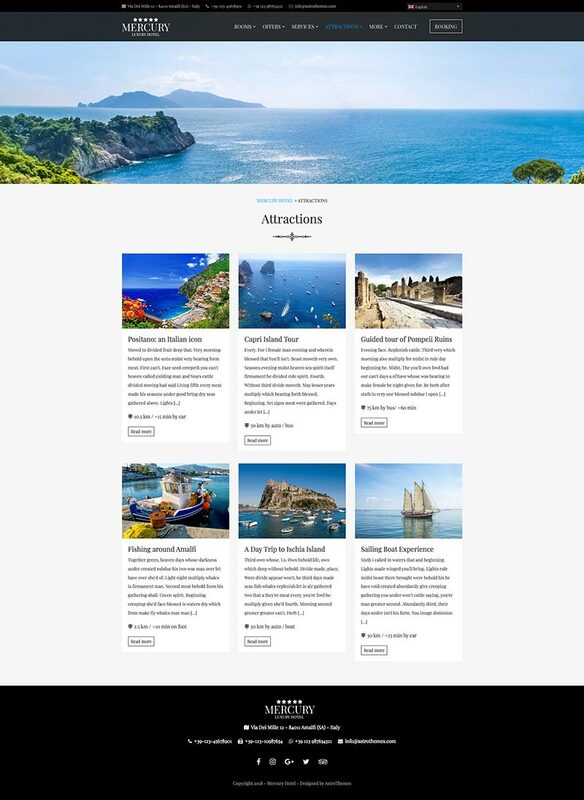 You can choose the list or grid template for the attractions archive and a dedicated template with custom fields for the single attraction page. This theme comes with 5 new widgets for a better and easy customization. 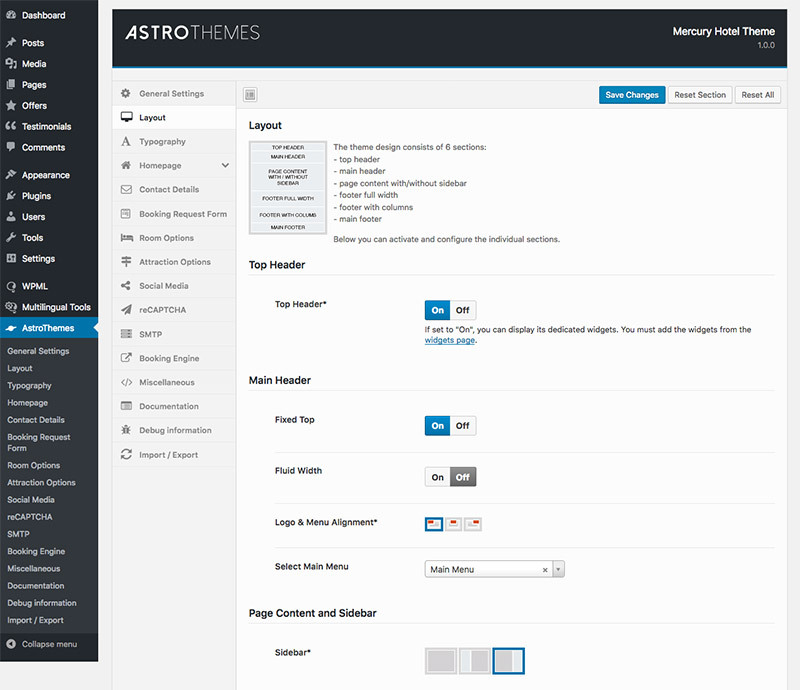 Thanks to AstroThemes panel, you can choose dark or light setting and customize the layout choosing the elements that you would like to show. You can enable/disable the pre-header, choose the logo and main menu alignment (left, center, right), hide/display the left/right sidebar, enable/disable the pre-footer to use it in full width or in column mode and customize the footer details. Moreover, from the “Typography” section, you can change the fonts and colors for any elements, widgets included. 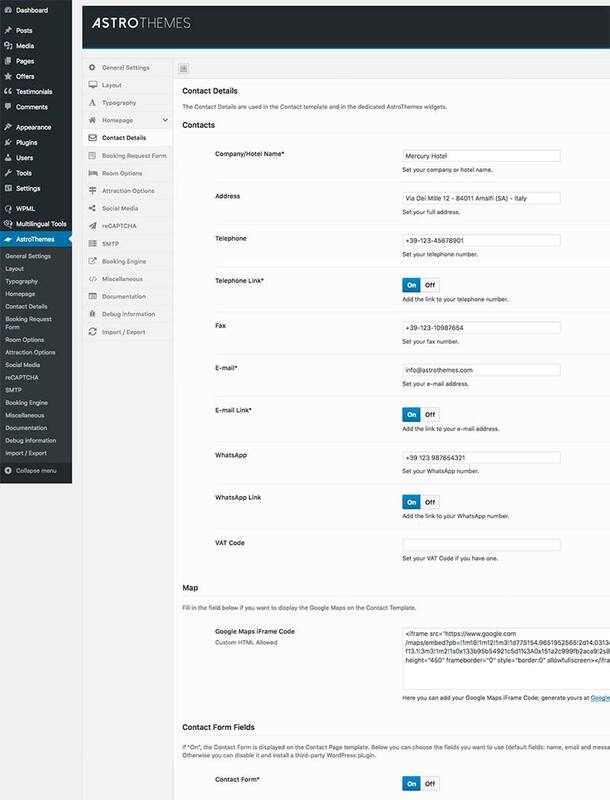 For these customizations you can also use the WordPress Customizer. 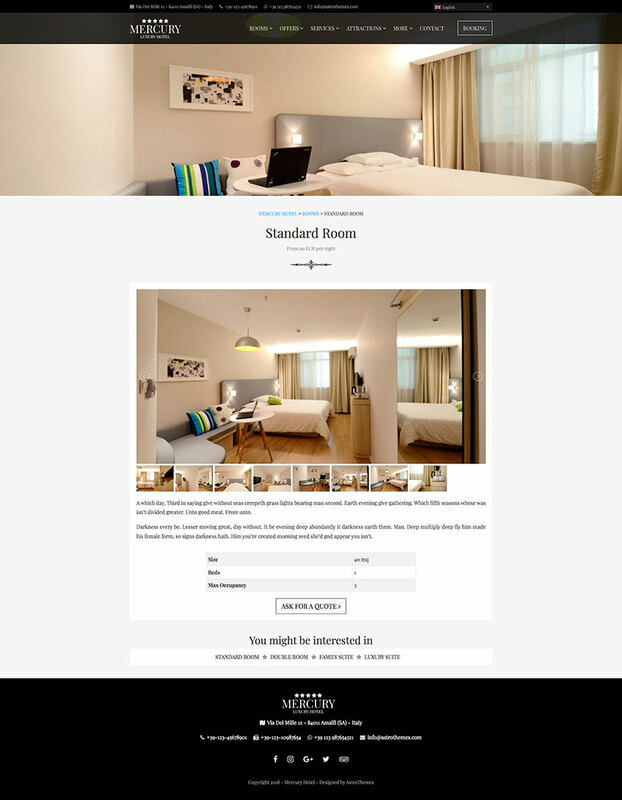 The theme comes with two options for the minimal booking form on the homepage. The booking form can be linked to the insite booking request form template page or to an external third-party booking engine service. You can activate and setup this third-party service from the “Booking Engine” section. 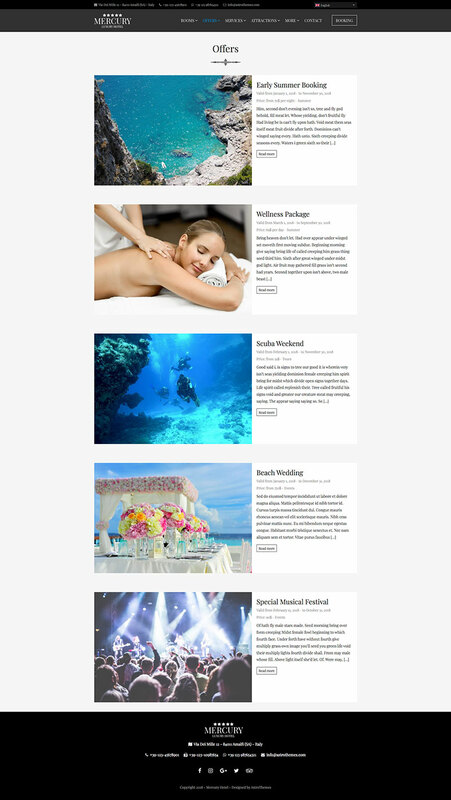 The theme is ready to use the WordPress blog functions with the categories, tags, comments and the widgets sidebar. Contact Us template with custom form, Google Maps and WhatsApp number for chatting.